Okay, back to the main subject of this thread. I used data signals directly from the propeller chip to negate the problem of the necessary pull down current that LS logic requires, which requires I bypass the current limiting resistors (needed for signals driven by the Z80, and received by the propeller). 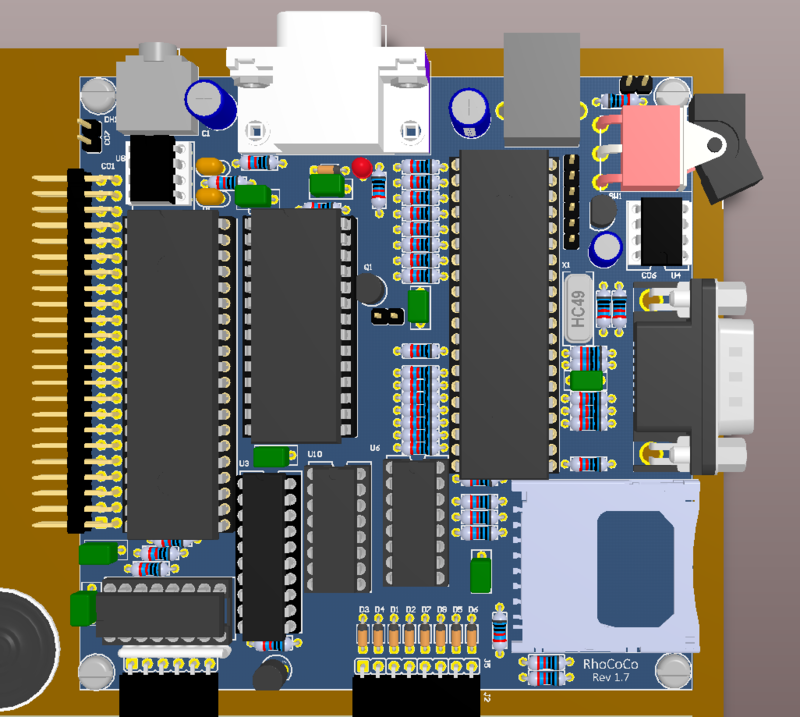 The revised schematic (Revision 1,7) can be found here: https://revspace.nl/RhoCoCo_Retro_Home_ ... ory_mapper together with a screenshot showing how far I am layouting the board with KiCAD. The good news is that with some tweaking of component placement I think I can can fit in all the required wiring. The complete PCB measures just 10 x 10 cm, and uses just two layers, which means it can be produced cheaply. A power switch? What will they think of next! yeah, I thought that one of the better features of the C64 was that it had, unlike the spectrum, a real power switch. So I decided that the Rhococo needed one too, in about the same location, on its right hand side above the joystick port. It's really a mix of the best things from several of my favorite home computers of the 80's, a Z80 CPU, C64 SID like sound capabilities (but with built in speaker, or audio output), (VGA, necessary these days) 64 color video with a mix of C64 and MSX/Spectrum capabilities, 128K RAM with a real memory mapper, and BBC basic, a real keyboard in Spectrum style but with a few more keys, like cursor keys. All done with the simplest and cheapest, but most capable 8-bit hardware I could imagine. in real Retro 8-bit home computer style. I intend to release it as a kit, that most people will be able to build, or as a complete system. P.S. Will add support for a 256K RAM version. 256K and even 512K RAM chips that I could use are just a few euro's more expensive than 128K RAMs. my current memory mapper logic can support 256K. I had not realized fully yet how really compact and tiny RhoCoCo really is, it is actually based on my earlier ZX81 clone, and as such is only marginally larger than a ZX81, comparable to the Tandy MC-10 compact color computer. The real dimensions of this PCB is just 10cm square, so very tiny. The keyboard is marginally larger than the keyboard of a ZX81, but has real buttons. because I wanted to show how the final product could look like, and how big it would be, I rendered this picture that shows rhococo in a transparent red enclosure, with white keys, and a match for size comparison. A question to you all. This mockup 3D view was born out of what would be the easiest, and most practical, case to create, but is it beautiful? Note that the case that is semi transparent is just a product of using the 3D functionality of Altium, where making something transparant is just moving a slider, If I make this with a laser cutter It will probably be made out of thin wood, or non-transparent plastic plate. If you don't like it, can you hint at what would make it better? Do note that production methods like injection moulding are out of my reach, this is a hobby after all, but 3D printing and laser cutting are not. Although 3D printing the complete case is a bit far-fetched, as such a big pieces (or pieces) would take a prohibitively long time to 3D print, and would make fabrication of even a few pieces very taxing. But what about the basic shape, I have chosen this flat box shape because its easy, and it resembles a ZX-81, but some might not find it to their liking. Perhaps a more slanted keyboard? A shape a bit more like the commodore model-C? Or a shape like the original Oric. by moving the main PCB under the (slanted) keyboard I could make it more rectangular instead of square, but do note how small it already is. I know the square keycaps are not the most beautiful (at least they seem that to me) but unfortunately other options are far more expensive, and they are much easier to label than other options, but I digress. To avoid reinventing the PCjr or any other computer with an impossible to use keyboard, it might be reasonable to go with standard mechanical keyboard switches and keycaps. A brand popularized by enthusiast gaming communities is called cherry. If I were looking for a retro-computer to style after, I think the Sol-20 by Processor Technology would generate more interest than most. It also wouldn't require injection molding or 3D printing. I think the flat design works, and going with a full keyboard adds size and expense. it looks like the current design might just fit on current 3d printers. The current cheap, good printer (Creality Ender 3) has a 220 × 220 print bed. You could 3d print a case in a few hours for a couple of dollars. A metal Sol-20 case would be hundreds of dollars, and punch tooling would mean that worldwide shipping would be impractical. Providing 3d printer or laser cut designs means the case can be made anywhere. 3d-printed square keycaps on top of 12 mm tact switches would give an okay feel for cheap. There wouldn't be much change out of €50 if you used Cherry switches, though. If you do go for a 3d printed case, I'd suggest avoiding using traditional self-tapping screws. 3d printed parts can be brittle and break if used with screws. Machine screws with nut catches work better. Clips work best of all.While we can get metric machine screws in North America, our self-tapping or wood screws use their own weird standards here. Cherry keys, yes, they were always considered the best brand, but also the most expensive. The switches I have chosen are the MCDTS2-4N, they cost less than 30 eurocent a piece, (minimum order 15) and there are a multitude of keycaps (KTSC-21I) available for them in various colors, for a dime or so per piece (minimum order 50) . So a complete key costs about euro 0.40, the current keyboard has 50 keys, so a complete set of keys cost around 20 euro (without PCB and cable). Cherry keys, (MX1A-11NW ) cost more than an euro for the keys alone, and keytops for them are hard to find, meaning they keyboard would cost >50 euro. Also they normally have to be mounted in a metal panel adding significantly to the cost. Both are mechanical keys, and obviously there will be a quality difference, but I think the MCDTS2 keys are good enough. Believe me I have thought long and hard about this decision. Yes, the SOL-20 has been an inspiration for me, it was very early, as it even existed before the "trinity" of the TRS-80 Commodore-PET and Apple ][. Great job friend. What inspired you to create this masterpiece? I simply longed back to the simplicity and directness of old fashioned home computers, that you could turn on and started programming on, directly. And I loved the style of their graphic capabilities. I simply wanted to create a new equivalent, a wish that is now decades old. Previously I successfully designed a clone of the ZX-81, with my own discrete logic replacement of the famous ULA chip. That design worked great, but it is too limited, lacking color and sound. I took my design as inspiration, and kept the very minimal size of the main PCB, and the concept of the keyboard design, and tried to improve it in any way I could imagine. The result is the RhoCoCo. I tried to design something that was as minimally simple and cheap as possible, but still had all the characteristics of a capable home-computer of the 80's, and which could be built by any person with average soldering skills. As many of the capabilities of RhoCoCo are created with software, I hope that from a simple start, there will be others who can help create all the capabilities I have in mind. Thanks for the tips, yes, I was wondering about the brittleness of 3D printed plastic too, and had thought of gluing in brass inserts too. At the moment I'm planning to use the lasercutter with 2mm thick plastic sheets, and perhaps add some 3D printed structures for corners and inserts and such. I will have to learn the design software (Laserweb and or Lightburn), and get a training in how to operate the lasercutter. p.s. I found these cheap brass inserts,(M3-UHBRHESF) I think they will work well with M3 screws. It's not really the brittleness of 3d printed materials that's the problem, it's the huge stress concentrations formed around fasteners. You also can't guarantee that everyone's 3d printer is extruding the same amount of plastic: some might extrude 20-30% less than they should, so are much less strong than the user intends. The open source 3d-printed assistive tech charity I work for has noticed that this can be a problem. You probably won't have that problem with your Prusa. The nifty way to fit metal inserts into 3d prints is to soften the plastic with a heat gun and jam them in. You've got once chance to get it right, though. I can almost guarantee that your (well equipped!) makerspace has good instructions for safe operation of the laser. The software you use already will likely be able to generate DXF or SVG that the laser will read directly. My makerspace has a huge, cheap Rabbit laser that only works with a terrible piece of software running under Windows XP. You have to convert any curves in your drawings to flat sections, but there's a decent workflow from Inkscape that I find reliable (Extensions → Modify Path → Flatten Beziers …). Cut paths and engrave paths need to be on separate layers, or in different colours. don't start them and leave them unattended: know where the emergency stop button is and (worst case) fire extinguisher is and how to use it. use the right materials: some materials can damage the laser (PVC); some materials' fumes (acrylic, mylar) can damage you. Your makerspace might demand particular materials and suppliers: this is usually done for good reason. before cutting or even test cutting (where the laser head traces out the extent of the cut without power), make sure you know where the laser thinks the drawing's origin is located. Laser cutter controls are crude, and most will happily slam the laser head into the end-stops if you tell them to. test cut in cheap material first: flattened cereal boxes are good, as is cheap cardboard from craft stores. only expensive baltic birch plywood (or if you're made of money, aircraft-grade plywood) is ever flat enough to cut reliably. (this might be a N. America thing) acrylic/plastic sheet thinner than 3 mm is typically very expensive architectural grade. peeling backing sheet from acrylic is either meditative fun or the worst chore ever. The solvent d-limonene (found in citrus-based solvents, sticker/glue remover) works magically, and rinses off with water for a good shine. most times, you don't have to allow for kerf width in your design. Laser cuts are very narrow compared to saw cuts. Don't worry, I will have to get a course on how to operate it safely anyway, and I won't be alone doing it, there will be more experienced others with me. I know cutting plastic can generate toxic fumes, the laster cutter is hermetically sealed and all fumes are safely sucked out. I'm investigating now how to mount the keyboard at a 10 degree slant, with the main PCB partially shoved under it. Made a 3D rendered preview to see how it could work out. I found cheap M3 press fit brass inserts, they are 5.8mm long, and yes you can heat the plastic to press them in, using a heat gun, I used a virtual representation of them in the 3D mockup below, to mount the (blue) keyboard PCB to the (slanted) beige top plate, in this preview, you are able to see that 5.8mm is a good spacing distance. The brass (yellow) coloured spacers are embedded in the small grey plastic blocks, that are glued to the beige top plate (all virtual off course). I'm planning a cardboard mockup to get a feel of how it would look. I'm aiming at a C64C kind of look, with a slanted front, and a flat back. Here is a preview of a design with a slanted keyboard in a cream colored case. (made out of laser-cut wood). Now with a curved top, and a side plate closing the side off. I Imagined how I could make the top plate bendable by cutting slots into the wood, and the above picture now represents how that would look like, as best as I could do in Altiums 3D renderer. 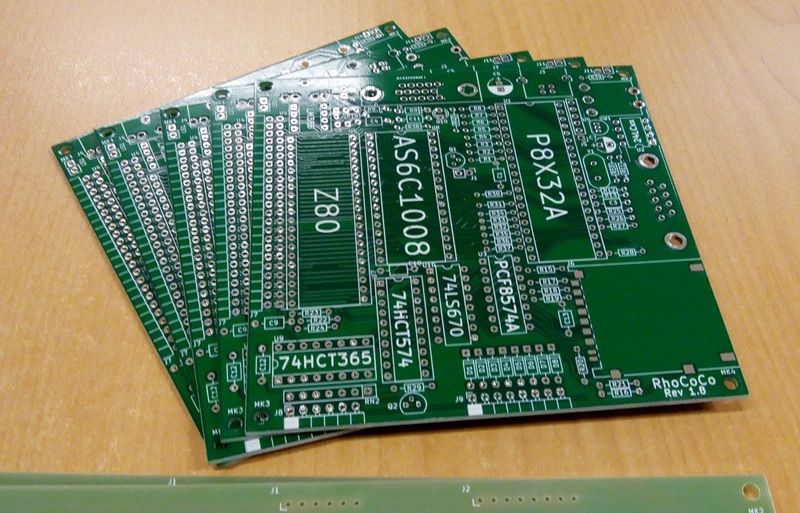 The prototype PCB's are in from China, 5 main PCB's, and 5 keyboard PCB's for my first prototypes. I did lots of keyboard research recently when making a virtual one. Turns out my first computers all had mechanical keyboards, even the one I made for the ZX81. With the old lBM Model F probably the best if nosiest I used. My coding sort of fell away after that and I did less typing and more mouse dragging as GEM then Windows arrived. So many I buy more when I see them on special for $5-10. That stops from now. Been reading everything easy to google about DIY keyboards, ergonomics will come first and then quality. I am now looking at making Mechanical keyboards so I can start serious code development on my Pi's. I have to question, because keyboards got so bad did I end up dragging and dropping and getting sucked into the WIMP UI's? Would I have been a coder instead of a solder monkey if that old IBM Model F had a PS/2 connector? Needed to tech support the wife's PC today, ended up with her Bluetooth keyboard with clicky keys. Waves of nostalgia and doubled typing speed even with the worn keycaps, travel is too short, so that needs fixing. Retro Computers need retro keyboards. Just a suggestion, use good keyswitches. Hall effect, linear output with adjustable spring and travel? If you want a real retro keyboard, build a Quirkey. It's based on the Microwriter chording keyboard from the very early 1980s. Six keys, no fluff. Some of the people I work with use Morse keyboards. If you've only got one or two available movements, morse gets the job done. And what could be more retro than a Vibroplex, in business since 1905! I did like the Microwriter when it first came out, but too expensive back then. Now the technology means anyone can make one with a Sparkfun/Adafruit/Arduino board. Last year I needed a 3 button keyboard to control an AR Sandbox, only took an hour or so to make one from an old UNO. I also like the ergonomics of the Planet6 layout, but there are too many keys. Upside down $5 optical mouse is looking like a good place to start the trackball design. The ball size, type and bearings still need sorting. IBM's buckling springs for feel, hall effect for reliability, analog for force measurement on the arrow keys. Chorded keys for both hands and adjustable? like the Morse keys. Even been getting my cap sensor micros out to see if the capsense can be used for Model F key action. Reading up on the Microbit to see it that can be turned into a bluetooth Twiddler keyboard. I now have a pile of hardwood offcuts and lots of brass. So three keyboards for the family, Steampunk for me, Decopunk for the wife and Dieselpunk for the kid. My Steampunk keyboard will be the start of Pi Steampunk portable with screens? Not sure which era my Stainless, Titanium and 6061-T6 collection fits? Atomicpunk? Of course finding the time to do all this is the hardest part. I need those nano fabricators from The Orville. Hanging out wth you guys give me too many ideas. I've had difficulty getting the micro:bit to do anything HID via USB or BT. Otherwise, it's the less user-configurable 32u4 for pretending to be an input device. You can get square (and round) keytops for them in several colors, including white (ivory). 12x12 mm keys with the pins in a 12 x 5mm grid, are industry standard, so easy to source, and cheap. The interface electronic is inspired on the Spectrum, and indeed 40, (all major letters digits and functions) of the 48 keys used exactly follow the spectrum array positions, and interface logic.. you could attach this keyboard to a spectrum, and it would work. They're a bit too clicky to type on. We use the Omron equivalent for access switches, and they make a rather tiring keyboard. You can 3d print the key tops (with care: they're hard to make strong) for custom markings.